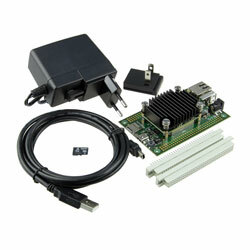 RS Components has added a new portfolio of advanced modules based on FPGAs and SoC ICs from Trenz Electronic. The company has added the line of easy-to-use development boards and SoMs to help educate engineers and researchers working in industry or academia to get them up and running in a relatively short timeframe. Aimed at a range of industrial applications, in addition to many scientific research areas, the modules are ideal for embedded vision, industrial cameras for monitoring and control, medical instruments, AFM, and ASIC-emulation applications, among many others. Initial products in the range include a series of Xilinx FPGA-based boards, such as a Kintex-7 FPGA module with multi-Gigabit transceivers, an Artix-7 35T FPGA module with dual 100-Mbit Ethernet transceivers, and an Artix-7 based module offering 32MB of Quad SPI Flash memory and a large number of configurable I/Os.